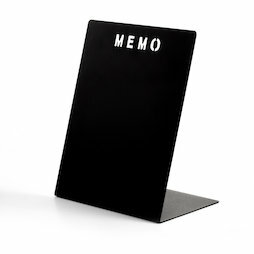 The black memo board MEMO holds on to your important things. The broad base ensures stability and you can place it wherever you need it at the time. Ideal for your desk, dressers in the hall, or countertop in the kitchen. Included in the delivery are 3 small disc magnets that can be used to attach notes and shopping lists to the memo board. The powder-coated black metal has a smooth surface that can be written on with whiteboard markers. You can remove the writing with a whiteboard cleaner. 1 pc. 26,45 EUR ea.